Michigan Future’s latest report looks at Minnesota, the most prosperous state in the region with the lowest unemployment rate, and the public policies that have helped it achieve that status. Below we will release shareable graphics that demonstrate some of the staggering data uncovered in the report. Follow the links below to download the graphics to share on your organization’s or personal social media. As you share them, we encourage you to use the hashtag “#StatePoliciesMatter” to help spark conversation around Michigan Future’s latest report. 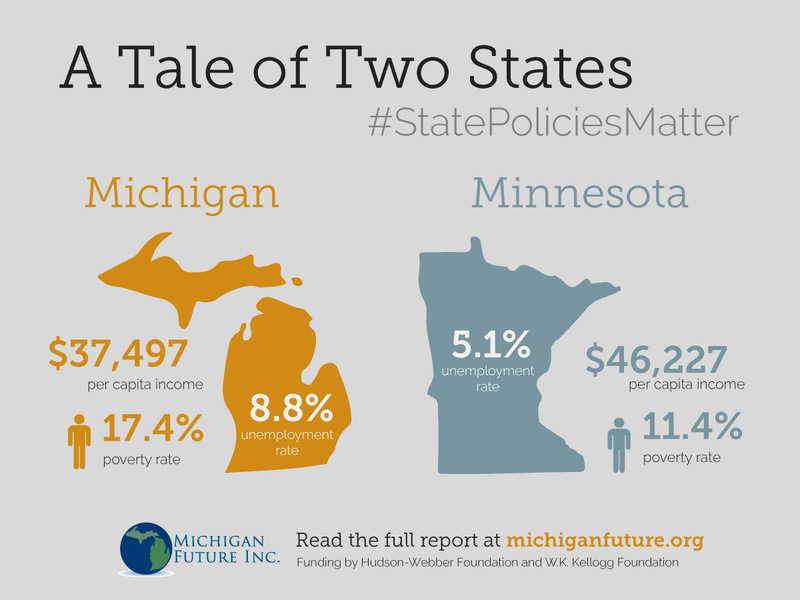 If you haven’t done so read the full State Policies Matter report here. How about adding Illinois to the comparison? Many of its “State Policies” match Minnesota and yet the conclusions might differ dramatically. One basic driver likely explains most of the difference in Michigan: the gutting of the Auto Industry. Our hope is that we can do more case studies going forward of both states and metro areas. Don’t really know the Illinois details. But my instinct is that they are not as high a tax and spending state as MN. They have a high per capita income but not great employment rate. More than likely their image on both policy and results don’t match their reality. No question the auto industry is driving our results. Have been for a century. But that hasn’t stopped elected officials from arguing that we need tax cuts to grow the economy and claim those cuts, not the auto industry, are the reason for good results when there are any and that we need them to get good results when our economy is bad. that strategy hasn’t worked, MN provides a alternative path that is at least worth considering. Is it supposed to be surprising that a state with a more prosperous economy is able to spend more money on services? It’s a pretty solid supposition to say that the causation for that correlation lies in the fact that having a better economy means more tax money to spend. To say that the causation is, instead, the opposite (that state spending is what created the prosperity) would require some fairly substantial evidence. I literally see zero evidence of that presented. Evidence of correlation is not evidence of causation…especially when the opposite causation is the hypothesis that assumes the least. Sorry…but I see nothing here of any convincing quality. The graphic presents an overview of the two states economies and their tax structures. Not a good place to delve into what caused the better economy. That is what the report is all about. 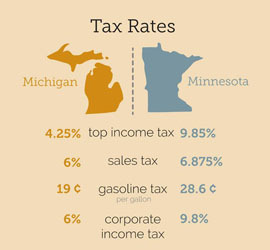 But even the graphic makes the case that higher tax rates–which we are told repeatedly leads to a worse economy–have not made Minnesota poorer. And lowering tax rates in Michigan have not made Michigan more prosperous. What the report details is Minnesota chose to have a higher tax burden and higher tax rates decades ago. Michigan chose the opposite path. Minnesota got more prosperous, Michigan less so. It isn’t a strong economy that leads to higher tax rates, its a decision by policy makers. They were warned when they made those decisions that the higher rates would ruin their economy. The opposite happened. Why? Almost certainly because the public investments they made provided economic benefits that were greater than the costs of the higher tax rates. The report is nothing but a dead link, by the way. But like I said, we could just as easily state that Alaska’s complete lack of income OR sales tax has not made it less prosperous…considering it is more prosperous than either MI or MN. Such cherry picked sets of data are completely useless whether you go as deep as a graphic or a report. 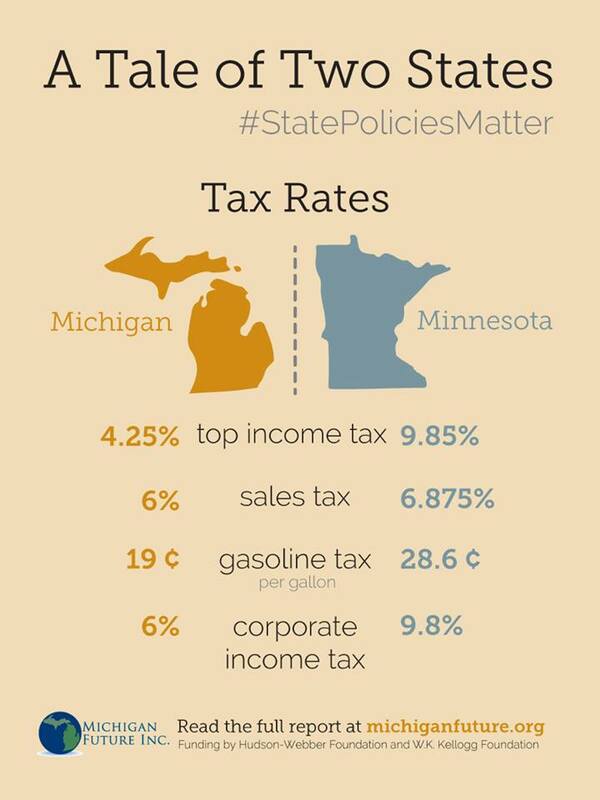 Furthermore you make more dubious claims in this comment: So…this SPECIFIC graphic shows that more taxes has not made Minnesota poorer and fewer have not made Michigan more prosperous? BOTH of those claims are about concepts that are time relative of each state to its former self. This graphic does not even touch such a subject . Such a statement seems to prove nothing except a lack of understanding of how to analyze and interpret data. Again…there is nothing here of any truly convincing quality. Fixed the link. Thanks for catching that. The report was not designed to research the role state tax and spending policies play in determining household economic outcomes.There have been a myriad of academic studies on that for decades. The link between the two is a lot less powerful that political advocates on both side of the aisle believe. What the report is is a case study of the most prosperous state in the Great Lakes and what their state policy framework has been to get better household economic outcomes. At the very least it provides details on a decades long approach that Minnesota has taken that is the opposite of what Michigan has done. And their results–-both level and growth––for those decades has been consistently better than ours. At the very least the Minnesota experience should put on the table as worthy of consideration a different state policy approach to growing the economy in Michigan. By and large neither party in Michigan has advocated for public investments as the lever that matter most to growing the economy. Its a debate Michigan needs to have.